If you work at different locations, on different computers — perhaps even on public computers — free portable software suites can save time and help to ensure the security of your information. Carry your bookmarks, your contact list, your passwords, your calendar — whatever data your need to get the job done. Plug in your USB key or other portable device, open the applications you need to use, do your work, then pull out and move on. There’s no need to download and install software, or to risk leaving your files on someone else’s hard drive. PortableApps brings a neat suite of open source software tools to just about any Windows-based computer, and (with the addition of Wine) to Linux, UNIX, and Mac OS X as well. It includes a web browser, email, calendar, antivirus, instant messaging, PDF reader, password manager, audio player, OpenOffice.org office suite (AbiWord word processor in the Light version), and even a couple of games. LiberKey is compatible with Windows 2000/XP/Vista only, with three ready-made software compilations and almost 250 portable applications to choose from: customize to suit the amount of storage space on your portable device and on your software needs. Lupo PenSuite runs on Windows XP/Vista with optional language packs that translate the basic English version into 28 languages. More than 200 “highly selected portable programs and games” are included, with a library of almost 2000 applications you can draw on to customize. Pegtop’s PStart is a “simple tray tool” designed to run any application that can be executed from a USB key or other portable device. 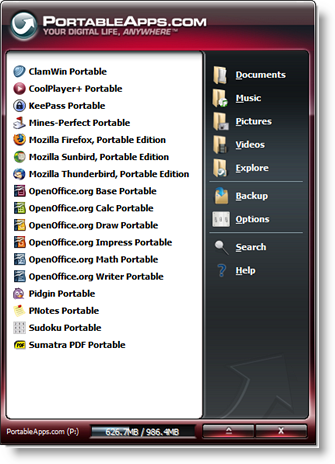 You’ll have to pick out the software yourself, but PStart offers a recommended portable applications list, and you can find a vast portable freeware collection at PortableFreeware.com. Is there open-source software on your USB stick or iPod? What portable applications suite or tool gets your vote as the most useful for busy nonprofit folks? I've been auditing small nonprofits' IT systems and that would takes ages if I didn't use some free software. Can't always rely on the organisations I visit having Internet access to download software, so it has to come with me. I carry a recent version of Belarc Adviser on a USB stick. What else is on the stick? AVG anti-virus, McAfee Stinger (gets rid of common malware nasties) and a few other analysis tools, a free PDF creator, SyncToy (great Microsoft tool for doing backups and synchronising devices and folders), Office 2007 compatibility pack etc. Problem is with downloading these tools onto a USB stick, is you need to remember to regularly update them. There is also SSuite Office - BladeRunner. It is a portable office suite that runs directly from any USB memory device and is compatible with all Windows systems. Is only 13.5 MB in size for download.